In early December 2009, Barack Obama left a meeting of the White House Forum on Jobs and Economic Growth. Walking down the hall, he fist-bumped a custodian named Lawrence Lipscomb, and a White House photographer snapped the moment, which became one of the administration’s enduring pieces of visual rhetoric. This could be taken as a cheaply populist photo-op for someone who campaigned to the left of where he governed, the substitution of an appealing gesture for the pursuit of policies that might benefit a janitor, like free college or government-negotiated medication prices. But it might also be evidence of Obama’s substantial, unusually genuine (for a politician) interest in the lives of other people. Either way, when the first black President, whom Joe Biden once called “clean and articulate,” touched hands with a working-class man who was emptying a trash bin, many narratives about labor, race, power, and comfort were tangling. 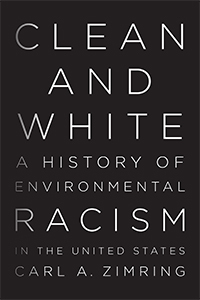 If you heed Carl A. Zimring’s Clean and White: A History of Environmental Racism in the United States, it wasn’t coincidental that Biden praised Obama as exceptionally “clean” or that people of color were infuriated. Non-white Americans have long been conceptually associated with filth and disorder in the nation’s cultural imagination and literally burdened in their jobs and homes by pollution. By “reconsidering the history of the nation through the lens of dirt,” Zimring demonstrates that African Americans and Latinos reap comparatively fewer of capitalism’s beguiling fruits while enduring most of its environmental burdens. In the Obama era, as before, a darker-skinned American is more likely to sort waste for a living, and to dwell near sources of pollution, than a white person is. Clean and White does many things. It tracks the tension between labor and capital amid the largest experiment in open markets ever devised, the USA; its final chapter, about the 1968 Memphis Public Workers’ strike, which presaged the environmental-justice movement, is gripping. It underscores that the US committed genocide during the nineteenth century: in Andrew Jackson’s chilling euphemism, “we now propose to acquire the countries occupied by the red men of the South and West by a fair exchange, and, at the expense of the United States, to send them to land where their existence may be prolonged and perhaps made perpetual.” It also functions as a primer on biopolitics. More specifically, it’s a handy introduction to the insane racial “science” used to justify slavery and Jim Crow, and to the contemporary residue of this “politicization of biology.” (You can probably guess which race was deemed most advanced.) It records ways that whites reacted to mass immigration and domestic migration (not well—part of the response was KKK terrorism, Exclusion Acts, and Rust Belt ghettos). And it narrates how Americans came to own so much stuff and explores how we deal with the wastes of consumer capitalism, which reshapes the entire planet to create new market hungers. Through it all Zimring convincingly argues that the mainstream American imagination contains two great anxieties: an accelerating knowledge that the systems that give us things like Hondas, iPhones, and burgers are environmentally disastrous; and a frantically repressed sense that this catastrophe falls hardest on people of color. White Americans have never been very good at acknowledging, let alone addressing, these problems. Even a modest recognition of them often results in aggrieved self-pity or resentful violence on the part of many whites: Donald Trump’s presidential candidacy, with its overtly nativist populism, fits a tradition. To make things more complicated, “white” is a protean, historically contingent category. (Jews and Italians, for example, weren’t broadly considered white until the mid-twentieth century.) As neoliberal capitalism poisons the earth, many Americans continue to embrace a narrative where whiteness is a state of hygienic grace, where every side effect of The Market is somebody else’s problem and (goes the fantasy) probably their fault anyway. For a country still dominated by whites—or as James Baldwin would say, those who think they are white—talk of whiteness as anything but the natural default category against which others are measured is rare in the public sphere. That’s a shame, because scholars such as Nell Irvin Painter (The History of White People) and George Lipsitz (The Possessive Investment in Whiteness) have written excellent books that contest this bleached narrative. Clean and White joins them. Sensitive to how physical realities and rhetorical practices intersect, eager to bring ethnic studies and environmental history together, and writing with moral vigor, Zimring does all a historian can to deepen the public discussion of race and environmental peril.